Debuting at the con in prototype form, a strictly limited batch of 10 grey resin casts were produced by Tru:Tek, each coming packed in a custom dated, signed and logged box for added authenticity. Priced at $75 a piece, only a couple of these guys remain… Stay tuned for details of the first online preorder in an unpainted, squishy “Ooze-It” green soft vinyl next week! Limited to a run of just 10 pieces, The Disarticulators are offering 5 of the protos alongside an extra special item- a blank red soft vinyl cast of the Rotten-X head from Rampage Toys and Marmit! NEVER to be repeated again, this could be your one and only chance of bagging a slice of unpainted SHB in the West… Priced at $60 for the standard release and just $80 for the set, again, just a couple remain of each! Atomic Uchuujin “Blind to the Truth” Mystery Bag Edition: Having previously only seen 2 very limited con/event releases in the past, The Disarticulators’ infamous Atomic Uchuujin returns for a special one-off blind bag release! Inspired by banned Ultra 7 character Alien S’Pell (head over to Ultraman Wiki here to find out more), the Zectron designed/sculpted figure has been produced in a UV resistant keshi-style rubber courtesy of Tru:Tek. Limited to an edition of 10 one-off tints and finishes – including the elusive “gift only” neon purple – the 2.5″ tall figures come packed in premium foil bags, available for just $25 each. The Leucotomy Ball: UK apparel brand Leucotomy have teamed up with The Disarticulators for the release of their very own signature ball toy! Designed by Leucotomy’s Gabe Mackenzie and sculpted by the hugely talented Zectron, the 2″ ball – roughly the same scale as the previously released Oozeball – has been inspired by a Manga short story compilation (name forthcoming), blending a macabre, exposed flesh design along with elements from Cure’s Thorn Ball Boogieman to devastating effect. Debuting at the con in both flesh and GID colorways courtesy of Tru:Tek, both editions were limited to just 10 piece each, coming bagged and headed with art from Gabe for just $30 a piece. On top of the main runs, a number of blind-bag one-offs are also up for grabs, so be sure to head over to the store early to avoid disappointment! The “Strange Kid” Screwball: Originally debuting right here way back in June, the Disart ToyLabs’ debut collaboration with Strange Kids Club – the Screwball – returned for an all-new NYCC exclusive release! Based on an illustration for SKC’s ongoing Circle Jerks sticker line, the stunning gross-out sculpt was originally undertaken by artist Jose David Cifuentes Ulloa as a fan project, quickly sparking the interest of SKC editor, Rondall Scott III, and ultimately leading to a full scale toy release. 3D printed, prototyped and produced courtesy of Tru:Tek over at Disart ToyLabs, the 3″ x 2″ figure has been cast in both GID and flesh-toned rubber, limited to 10 of each and priced at just $30. As with the Leucotomy Ball, a number of blind-bag one-offs will be available, so be sure to check stock early to avoid disappointment! But again, that’s not your lot! 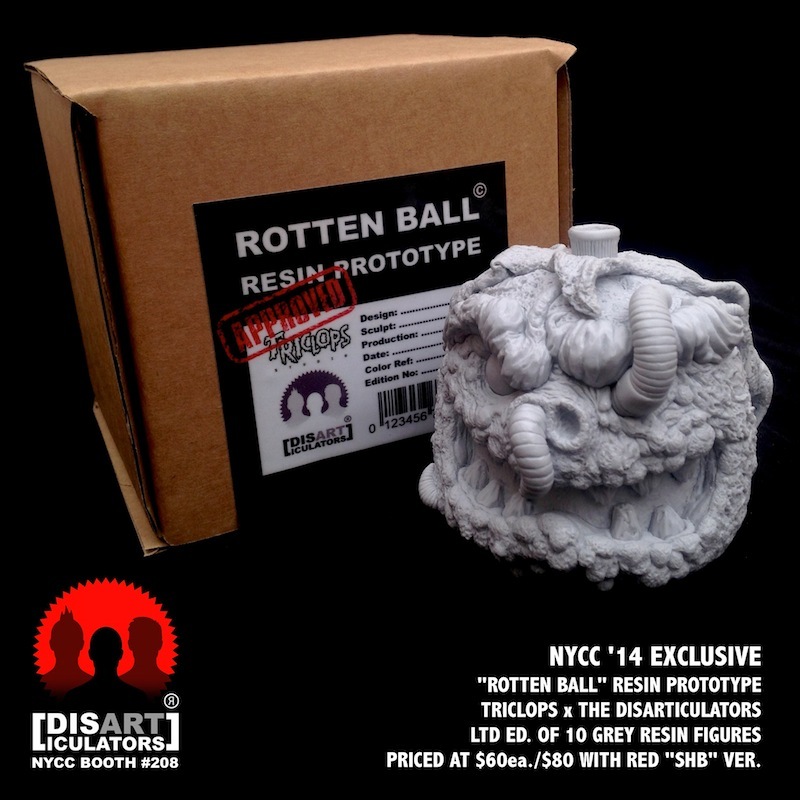 On top of the standard run, The Disarticulators will also be offering up another batch of 5 protos packed with an extra special item- a blank red soft vinyl cast of the Rotten-X head from Rampage Toys and Marmit! NEVER to be repeated again, this could be your one and only chance of bagging a slice of unpainted SHB in the West… Going on sale Saturday, October 11th, these sets have been priced at just $80 each. Atomic Uchuujin “Blind to the Truth” Mystery Bag Edition: Having previously only seen 2 very limited con/event releases in the past, The Disarticulators’ infamous Atomic Uchuujin returns for a special one-off blind bag release! Inspired by banned Ultra 7 character Alien S’Pell (head over to Ultraman Wiki here to find out more), the Zectron designed/sculpted figure has been produced in a UV resistant keshi-style rubber courtesy of Tru:Tek. 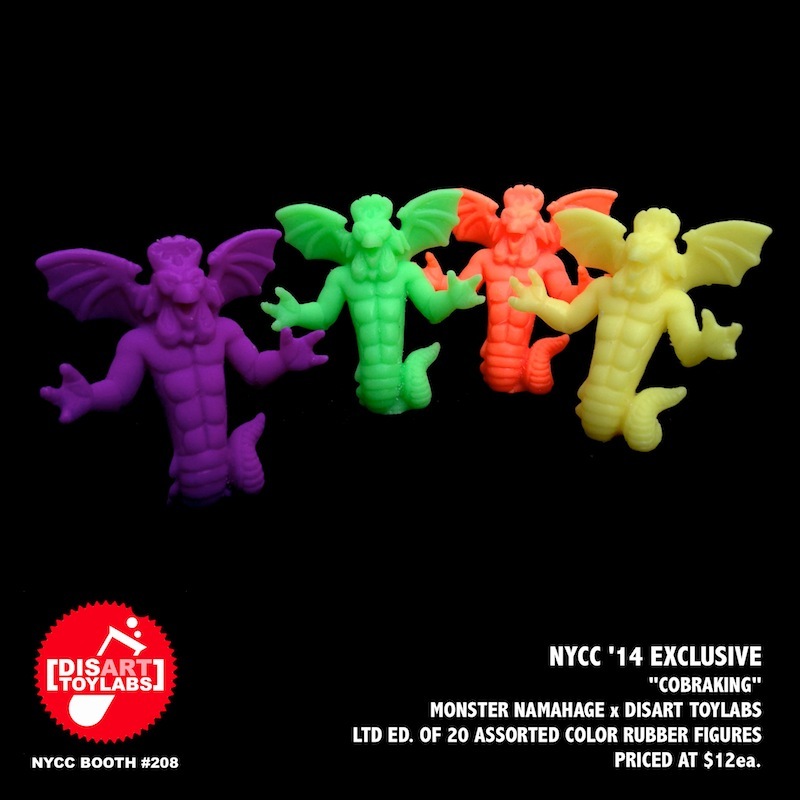 Limited to an edition of 10 one-off tints and finishes – including the elusive “gift only” neon purple – the 2.5″ tall figures are set to come packed in premium foil bags, selling throughout the con blind-bag style for just $25 each. Debuting at the con in both flesh and GID colorways courtesy of Tru:Tek, both editions have been limited to just 10 piece each, coming bagged and headed with art from Gabe for just $30 a piece. On top of the main runs, a number of blind-bag one-offs will be available at various times throughout the con, so be sure to head over to the booth and check them out! Calling all customisers! On top of the standard release, we will also be offering up a round of 10 Icelops figures in a blank white resin- perfect for those looking to paint the little guy up! Packed in the same foil bags as the main release, these will set you back a slightly cheaper $20 each. 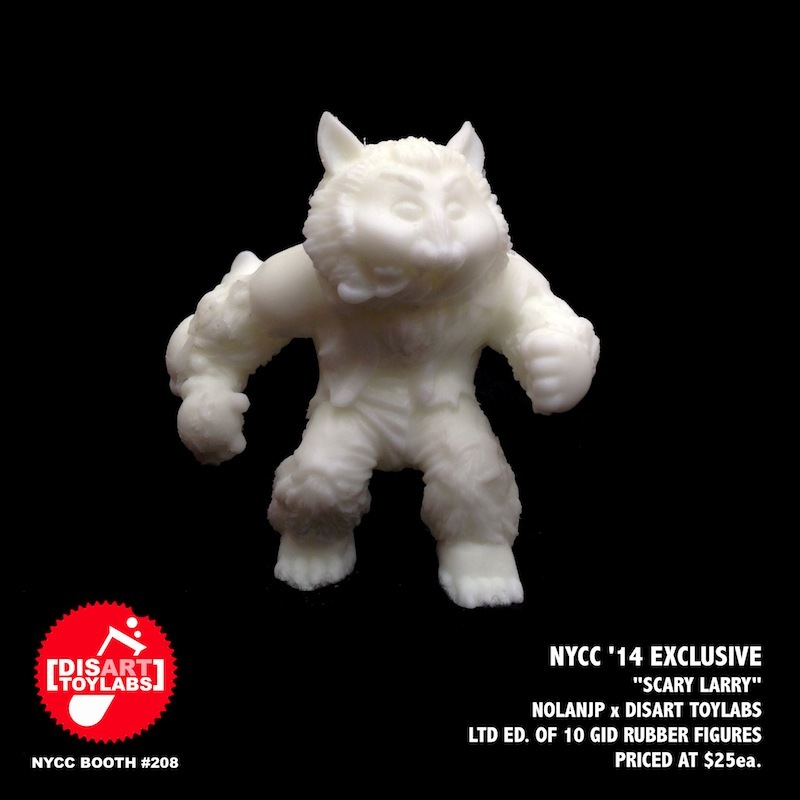 The “Strange Kid” Screwball: Originally debuting right here way back in June, the Disart ToyLabs are proud to reveal that their debut collaboration with Strange Kids Club – the Screwball – is finally set to return for an all-new NYCC exclusive release! Based on an illustration for SKC’s ongoing Circle Jerks sticker line, the stunning gross-out sculpt was originally undertaken by artist Jose David Cifuentes Ulloa as a fan project, quickly sparking the interest of SKC editor, Rondall Scott III, and ultimately leading to a full scale toy release. 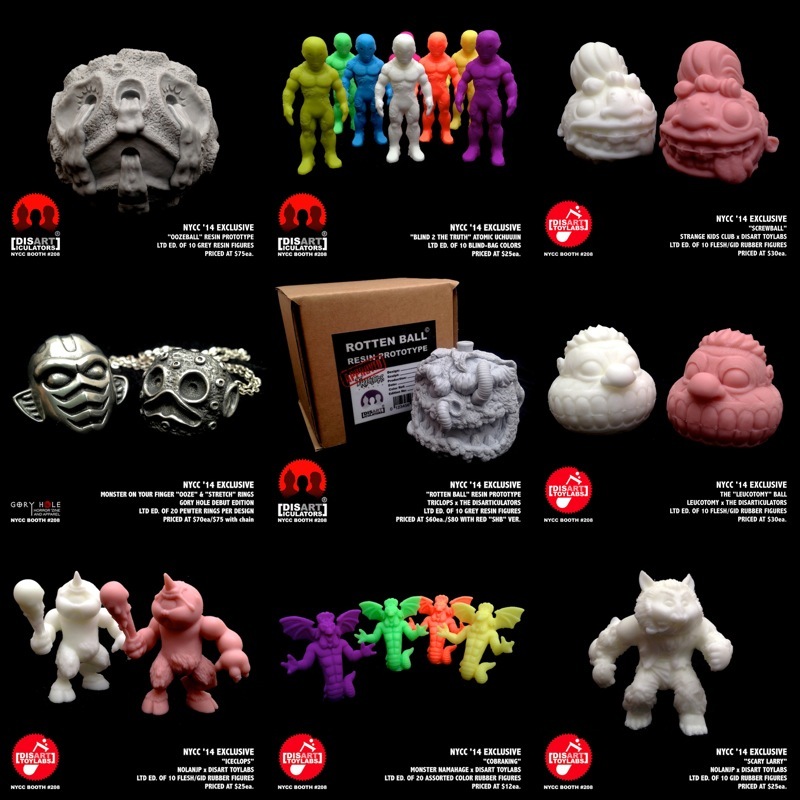 3D printed, prototyped and produced courtesy of Tru:Tek over at Disart ToyLabs, the 3″ x 2″ figure will be up for grabs in both GID and flesh-toned rubber, limited to 10 of each and priced at just $30. As with the Leucotomy Ball, a number of blind-bag one-offs will be available at various times throughout the con, so be sure to check back regularly to avoid disappointment! “Tarbman” and “Demon Quigley” Ltd Ed T-Shirts: As part of the regular Gory Hole release schedule, 2 different shirt designs will be offered up each month; one from owner Deadman and another from a featured ‘zine artist. Kicking things off, Deadman’s Simpsons/Return of the Living Dead mash-up “Tarbman” has been joined by a collaborative effort with illustrator Two-Dimes entitled “Demon Quigley”, paying homage to the classic “Horror Workout” VHS and its equally infamous mail order print ad. Limited to editions of just 20 pieces each in a NYCC exclusive black on white (a standard release is set for heather and a reversed black in Late November ’14), each shirt comes packed in a custom Gory Hole biohazard bag for just $25 each.